Spring RestTemplate can be used for load balancing. Load balancing is using multiple instances of the same microservice to maximize reliability and availability. It reduces the load on a single instance. Spring Netflix Eureka has a built-in load balancer called Ribbon. Ribbon can automatically be configured by registering RestTemplate as a bean and annotating it with @LoadBalanced. In this example we will focus on how to access a microservice instance transparently using RestTemplate and @LoadBalance. Run above class from IDE. Run above main class from IDE. The next example shows how to run multiple instances of our hello-service and access them via RestTemplate load balancer. 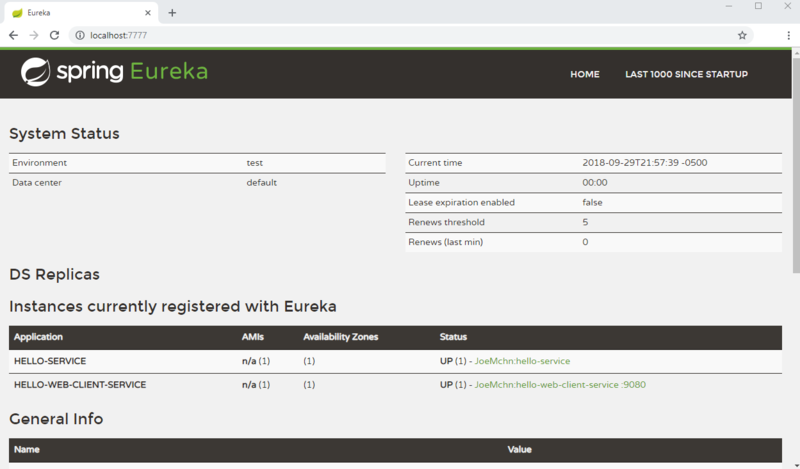 spring-cloud-starter-netflix-eureka-server 2.0.1.RELEASE: Spring Cloud Starter Netflix Eureka Server. spring-boot-starter-web : Starter for building web, including RESTful, applications using Spring MVC. Uses Tomcat as the default embedded container. spring-cloud-starter-netflix-eureka-client 2.0.1.RELEASE: Spring Cloud Starter Netflix Eureka Client. spring-boot-starter-thymeleaf : Starter for building MVC web applications using Thymeleaf views.